Thank you for watching the "Home & Family Show Primetime Holiday Special" on the Hallmark Channel! Enjoy some behind-the-scenes highlight photos that I took on our fun night of taping at Universal Studios. The weather was perfect for a Christmas special, "Los Angeles" style. There was a slight chill in the air, but let's be honest, 65 degrees is warm for many parts of the country. All the "Family" members were on hand for the festivities. I had the honor of designing the Christmas Centerpiece for our newly designed family room. Kenneth Wingard designed the garland and Tanya Memme designed a fun wall Christmas tree made with felt for kids to decorate! Enjoy these photos and please visit EdenMakers Blog again tomorrow, as I will have instructions and photos for making my Christmas centerpiece featuring repurposed materials. My castmates on Home & Family don't take themselves too seriously. Yes, we have our hair and makeup "just right," but we like to be silly too! Here is Dr. JJ Levenstein, Shirley Bovshow, Laura Nativo, Tanya Memme and Jeanette Pavini in the dressing room, also known as the green room, getting ready for taping the special. The same gang, Dr. JJ, Shirley Bovshow, Laura Nativo, Tanya Memme, and Jeanette Pavini, composed and more professional! You may know these three women referred to as "The Blondes" on Home & Family. Here are Debbie Matenopoulis, Kym Douglas, and Sophie Uliano listening to the Australian singing trio, Aria. Did you love their rendition of "Hallelujah?" Dr. JJ Levenstein with Kenneth Wingard and Matt Iseman. You can't get more fun than this trio! Love their sense of humor and talent. Did you know that Dr. JJ is also a chef? He graduated from Princeton with a degree in Architecture! 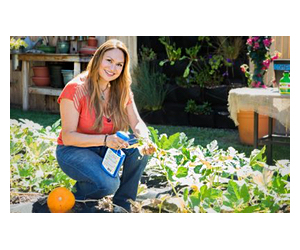 Green living expert Sophie Uliano is the real deal! Here she is between segments, "coaching" Kym Douglas, Dr. JJ and Kenneth Wingard on some yoga stretches. Did you know that Sophie Uliano used to teach yoga? Did you know that the handsome and witty Matt Iseman is also a credentialed doctor? He's enjoying being the center of attention, flanked by talented castmates – Laura Nativo, Tanya Memme and Jeanette Pavini. As co-host of the Home & Family Show, Cristina Ferrare is in touch with her spiritual side and leads the blessing for the Christmas meal. Family members and guests bow their heads in prayer and respect. Cristina Ferrare is a beautiful woman, inside and out. I'm proud to work with her. How does my "Matzoh Toffee" look? I swear it's better than Almond Roca! I made it with matzoh crackers, butter, brown sugar, chocolate and dry roasted almond slices. Visit my Foodie Gardener Blog tomorrow for the recipe! I'm too tired to post it tonight as I've been taping all day today. Our sweet and beautiful DIY expert Paige Hemmis stands proudly with the Australian singing group Aria. She's engaged to the handsome man with the mustache and beard. I've got to ask her his name! They were very sweet together. Look at Paige's tears of joy! Co-host Mark Steines was very busy taping but couldn't deny himself a little time with the "family!" Yes, we do like each other and everyone has a blast when we get together. Shirley Bovshow's Christmas Centerpiece, "Fire and Ice"
My custom designed "Fire and Ice" Christmas Centerpiece features snowball planters made from painted grapevine orbs, repurposed Christmas tree ornaments, battery-operated candles, and lots of bling! Designer Shirley Bovshow shows her "Fire and Ice" Christmas Centerpiece to Mark Steines and Cristina Ferrare. Close-up of the snowball planter I designed for the Christmas Centerpiece for Hallmark's Home & Family holiday special. I can't wait to share the step-by-step instructions with you. My Christmas Centerpiece is interactive. Along with beautiful plants and crystals, there is a pretty little cup filled with chocolates! Doesn't this succulent look pretty surrounded by beads and crystals? White Christmas cactus plant in bloom. What's your favorite Christmas cactus flower color? I hope you enjoyed my behind-the-scenes photos of the Home & Family Holiday Special! Please subscribe to EdenMakers blog for new posts, including instructions on how to make my "Fire and Ice" Christmas Cactus Centerpiece! Thank you for taking time to comment! You are one of the most thoughtful people I know. Happy Thanksgiving. Thank you so much for your many compliments and constant support. So happy that you had opportunity to be a part of the show this year. I’m happy to have served up some inspiration. Make sure to watch the Home & Family THanksgiving show, tomorrow on Wed.
What a fun show! I enjoy it every year as it helps to get me in the mood and prepare for the holidays. The centerpieces are gorgous! You know I love glitz and fantasy touches???? That centerpiece is stunning! I love that you use living plants. You are brilliant and beautiful, Shirley!